BY 2050, it will no longer be just fossil fuels keeping Australia's lights on. The price of large scale solar farms will have tumbled significantly, making them cheaper and more efficient than the coal-powered electricity the country relies on at the moment. New forecasts from the Bureau of Resources and Energy Economics suggest more than half the country's electricity, by mid-century, will come from renewable sources. The predictions point to a role-reversal between coal and green technology, with domestic electricity from coal falling to roughly 13% by 2050 as renewable hitting 51%. Wind will supply the majority of that, followed by solar. Currently, coal generates 60% of Australia's electricity, with renewables supplying just 13%. According to BREE's Australian Energy Projections to 2050, renewables were now more competitive under the Federal Government's carbon pricing plus new technology would bring down their costs. 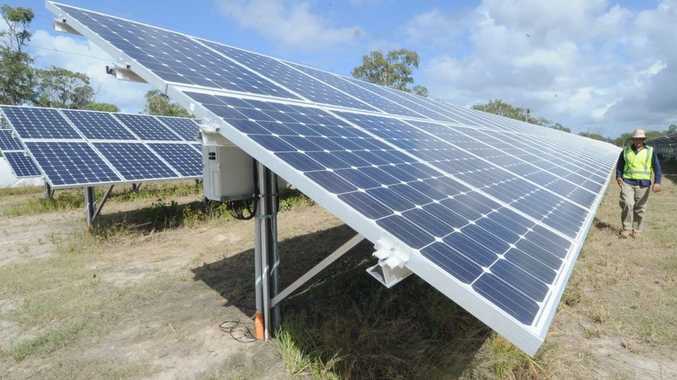 For now, solar remains still more expensive when compared to fossil fuels, but BREE senior economist Arif Syed said that would shift dramatically in coming decades. "At the moment, solar will not be much cheaper by 2020," Mr Syed said. "But after 2030, particularly after 2035, the market won't have to push them, they will be cheaper." Mr Syed said fossil fuels would likely always be part of Australia's energy mix, ensuring stability and back-up alongside renewables. Coal and gas from Queensland would remain strong, but its growth would continue in export markets. The exports of these were expected to increase by more than 69% by 2050, a forecast Mr Syed described as conservative.